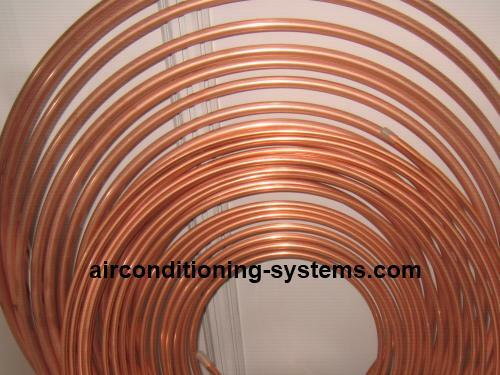 Copper tube is one of the components that is needed in air conditioning and refrigerant system. The tube is used as a path for the refrigerant to flow between system components and to contain it from escaping to the atmosphere. Sizing, installation layout and fittings must be done properly to ensure that the system runs efficiently. During installation, it is of utmost importance that moisture, dirt and other contaminants are prevented from entering the system. These foreign particles will affect the performance of the system and may even cause damage to some of the components. During the production of the copper tube, the inside of the tube has been cleaned and dried before being sealed at both ends to ensure that it remains that way. You must check to make sure that the refrigerant that is going to be used does not react with the copper. Ammonia refrigerant will react with copper hence it should not be used. Instead, the stainless steel tubing type will have to be used. A typical coiled soft copper tube. There are basically two types of tube namely the hard-drawn and the soft type. This type of tubing is rigid, hard and stiff. It is not easily bent and should not be bent. Fittings are used to obtain the configuration needed for the installation. The length commonly available is 10 feet or 20 feet. There are three standard weight with different wall thickness for each type. Type K has the thickest wall tubing followed by Type L and Type M. If you need a higher pressure tube, thicker type is to be used to ensure it can handle the pressure of the refrigerant. Type L outer diameters typically starts from 3/8 inch followed by 1/2 inch, 5/8 inch, 3/4 inch, 7/8 inch, 11⁄8 inch, 13⁄8 inch, 15⁄8 inch, 21⁄8 inch and 25⁄8 inch. The soft copper is flexible and comes in rolls of 25 feet or 50 feet. The typical outer diameter ranges from 1/8 inch to 13⁄8 inch. Markings of ACR are done on the tubing to indicate that it is used for air conditioning and refrigeration purposes. During production, these parts are cleaned and dehydrated to remove the moisture from the tube. It is then filled with nitrogen gas before being capped. In order to prevent the refrigerant from absorbing unnecessary heat from the ambient, the copper tube is insulated between the evaporator and the compressor at the low pressure side of the system. Hence you will be able to see the insulation material being wrapped around the copper tubes for this purpose. It is also to prevent condensation from happening on the tubes. When cutting the tubing to the required length, make sure that you use a proper tool such as the tube cutter.The burr on the inside of the tube that resulted from the cutting must be removed from the tube as these contaminants will affect the flow of refrigerant as well as affecting the performance of the system. When bending is required, take note that only the soft copper type can be bent. Use a proper tube bending springs to prevent flatten or kink. When soldering or brazing is required, make sure that you have being trained to do this and adhere strictly to the instructions of the manufacturers. Wear eye protection when particles are being released in the air as a result of your action. When you are doing annealing process where you heat up the tube and allow it to cool slowly, make sure that you use a flared flame over a distance of 1 feet at a time and not concentrating the heat on one location. Ensure the work place is well ventilated especially when fumes is being emitted as a result of your work. Do not breathe in excessive gas and adhesive.